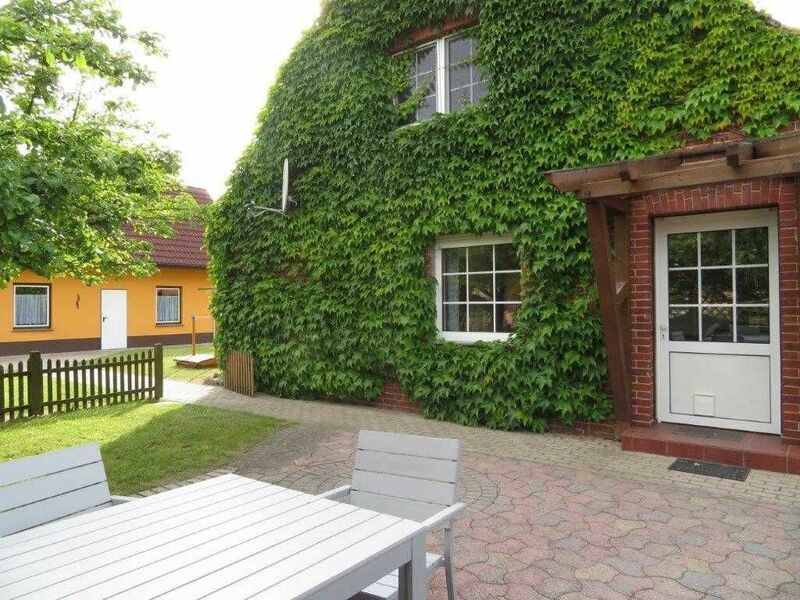 Non-smoking apartment (about 90 m²) on the ground floor of a brick house with wild wine with room for 4 people and a toddler up to 3 years (cot and high chair included) a 1000 m² plot in the immediate vicinity of the Müritz (300 m). In the bedroom one has a double bed and a wardrobe and a reading group with two chairs and a small table, on request, in addition a cot (up to 15 kg). The second bedroom has two single beds and a wardrobe. The bathroom has a shower and toilet. The kitchen is fully equipped with utensils for 6 persons, induction cooker 4x, oven, refrigerator, microwave, coffee maker, kettle, toaster, radio, bread slicer, mixer ... .In the living room with dining area is a large dining table for six people. In the living area with a romantic fireplace is a cozy sofa corner to Klönen and relax, but also to watch news with the large flat-screen TV. Other: Wi-Fi (inclusive), various board games and books, brochures for the environment, lockable shelter for bicycles, a wagon, washing machine (coin operated 2 € / wash) in separate arbor, parking. When booking a towel package this includes: 1 bath towel, 2 normal towels, 1 small towel. Tea towel and shower mat are included. Welcome to your holiday home in Rechlin Nord, quiet area between Müritz (300 m) and Claassee (300 m). The family-friendly Non smoking apartments are located in a separate building - here you can make undisturbed holiday. In the large garden children can romp carefree while you enjoy life in their own seating area with grill. To the sandy beach at the Müritz is only 300 m - for the picnic transport to the beach is a cart ready. The unique Müritz National Park is ideal for cycling, hiking and unforgettable experience of nature. Die Ferienwohnung entsprach genau der Beschreibung und ist toll ausgestattet. Schöne und komfortable Ferienwohnung, alles da, was zu einem erholsamen Urlaub beiträgt. Sehr schöne und geräumige Ferienwohnung, ruhig gelegen! Sehr schöne und geräumige Ferienwohnung, ruhig gelegen! Man wird nicht gestört und stört auch selbst niemanden - perfekt mit kleinen Kindern! Die Wohnung ist schön eingerichtet und funktional ausgestattet. Zu einer Wasserstelle an der Müritz geht man nur zwei Mal um die Ecke. Zudem war noch eine Badestelle ausgeschildert, an der wir allerdings nicht waren - der Weg war etwas weiter. Die Vermieter sind sehr nett, allerdings habe ich leider die E-Mail im Vorfeld nicht erhalten, in der der Kontakt stand, um die Anreise und Schlüsselübergabe abzustimmen. Diese ist weder im Posteingang noch in den Junk Mails aufgetaucht. Ein Anruf unter der angegebenen Nummer hat das Problem aber schnell gelöst und wir kamen innerhalb von 10 Minuten in die Wohnung. Insgesamt sehr schön und zu empfehlen! Your vacation home is situated in Rechlin-Nord, a place with a quiet, rural character with no through traffic. To the sandy beach at the Müritz it from the apartment Zilpzalp of 300 meters. The unique Müritz National Park is ideal for cycling, hiking and unforgettable experience of nature. Paddlers can only 300 meters Portage of Property to the launching is directly of the Müritz on the Bolter lock in the incredibly varied and motorboat-free in much of paddle area of ​​the Mecklenburg small lakes, the "Land of 1000 Lakes" plunge while sailing and motor boat captains of Marina can take from the trip to the Müritz and Mecklenburg Great lakes in Claassee. And for the technophiles nature lovers: Rechlin-Nord has a checkered history - marked by aeronautics and impressively documented in the aeronautical Museum.Über the well-built cycle paths and footpaths can be reached in about 3 km Rechlin center where all the shops for daily consumption are like supermarkets, bakers, hobby market, pharmacy, doctor, bank and others. There are also another marina with boat rentals, rowing and paddle boat rentals, bike rentals, restaurants, fishing permits issue and the river port. And with the steamer - or sporty bike or easily accessible by car - one occurs, for example to Röbel with the Müritz Therme or goods with the exciting and informative Müritzeum after Mirow Castle Island, or, or, or ... .. Fancy a walk on the Baltic Sea beach or a stroll across the Kurfürstendamm in Berlin? No problem, of Rechlin Nord, a day trip!